The global market for mica is driven by applications across a diverse set of industries such as electronics, construction, cosmetics, plastic, rubber, and paints and coatings. The market earns a dominant share of its overall revenues from the electronics industry, applications across which are expected to be the key driver of the global mica market in the near future. With a constant rise in the population of people used to seeing and working with a vast variety of electronic and electric equipment on a daily basis for an endless set of applications, the electronics industry is expected to exhibit excellent growth in the next few years. The trend is expected to lead to the development of sustainable growth opportunities for the global mica market in the coming years. Transparency Market Research estimates that the global mica market will expand at a CAGR of 2.6% over the period between 2016 and 2024. In terms of revenue, the market is expected to exhibit a 3.8% CAGR over the said period, rising from a valuation of US$478.1 mn in 2015 to US$669.3 mn by 2024. In terms of grade, the global mica market is examined for sheet mica, built-up mica, and ground mica. Of these, ground mica is the most commonly used form of mica owing to its extensive usage across filler applications. Ground mica is used as a filler in joint compound in the construction industry, in preventing gypsum plaster boards from cracking, and protecting walls from moisture. Ground mica accounted for a dominant share of over 50% in the global mica market in 2015. Over the next few years as well, ground mica is expected to remain the most preferred grade of mica owing to increased usage across industries such as construction, paints and coatings, plastic, cosmetics, and rubber. Sheet mica accounted for a 35% of the global mica market in 2015 and is expected to account for a similar share in the global market by the end of the forecast period. Demand for this grade of mica will be stimulated by the flourishing growth of the electronics industry, especially across emerging economies in Asia Pacific. Asia Pacific dominated the global mica market in 2015, accounting for a share of more than 40%. The rising demand for mica in industries such as electronics, paints and coatings, and construction has been the key to the substantial consumption of mica in the region in the past years. China was the leading producer and exporter of mica in the world in 2015. In the next few years, factors such as rising population and the subsequent rise in demand for electronic and electric equipment, paints and coatings, and residential infrastructure projects will be the key factors driving the market for mica in the region. India and ASEAN for the mica market in the next few years. Countries such as India, Japan, and China are expected to provide substantial growth opportunities for the mica market in the next few years. 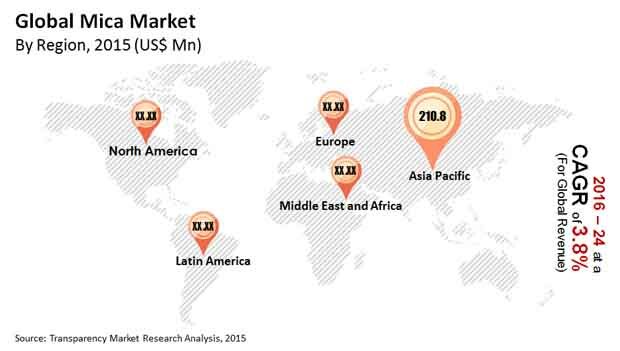 Europe trailed Asia Pacific in terms of consumption of mica in 2015, constituting a 19.5% of the global mica market. The mica market in the regions is anticipated to exhibit moderate growth with a 2.2% CAGR over the period between 2016 and 2024. Growth will be primarily driven by opportunities in well-established industries such as paints and coatings, plastic, cosmetics, electronics, and rubber. The stabilizing construction industry in the region will also be catalytic for growth of the mica market. Some of the key vendors operating in the global mica market are Gunpatroy Pvt. Ltd., Santa Fe Gold Corporation, The Premier Mica Company, Mica Manufacturing Co. Pvt. Ltd., Asheville-Schoonmaker Mica Company and Others. The report includes Porter’s Five Forces Model to determine the degree of competition in the mica market. The report comprises a qualitative write-up on market attractiveness analysis, wherein end-users and countries have been analyzed based on attractiveness for each region. Growth rate, market size, raw material availability, profit margin, impact strength, technology, competition, and other factors (such as environmental and legal) have been evaluated in order to derive the general attractiveness of the market. The report comprises price trend analysis for mica between 2016 and 2024. The study provides a comprehensive view of the mica market by dividing it into end-user and geography segments. The mica market has been segmented into paints & coatings, electronics, construction, cosmetics, and others based on end-user. End-user segments have been analyzed based on historic, present, and future trends. Regional segmentation includes the current and forecast demand for mica in North America, Europe, Asia Pacific, Latin America, and Middle East & Africa (MEA). Additionally, the report comprises country-level analysis in terms of volume and revenue for end-user segments. Key countries such as the U.S., Germany, France, the U.K., Spain, Italy, India, China, South Africa, Mexico, and Brazil have been included in the study. Market segmentation includes demand for individual end-users in all the regions and countries. The report covers detailed competitive outlook that includes market share and profiles of key players operating in the global market. Key players profiled in the report include Asheville-Schoonmaker Mica Company, The Premier Mica Company, Santa Fe Gold Corporation and Gunpatroy Pvt. Ltd. Company profiles include attributes such as company overview, number of employees, brand overview, key competitors, business overview, business strategies, recent/key developments, acquisitions, and financial overview (wherever applicable).